The daily spinning about itself. The annual orbiting around the Sun. The slow and continuous change in the orientation of its rotational axis, similar to the wobbling of a top. One cycle of this so-called axial precession was coined Grand Year, which approximately equals 25,800 annual orbits. The first motion, which is very easy to detect, is the daily rotation of Earth around its north-south axis. We have all seen it with our own eyes when, for example, observing sunrise or sunset, realizing that it is not the Sun that is actually moving, but that it is Earth’s rotation which creates this illusion. The night’s sky around Polaris in the northern hemisphere is another obvious observation of this movement. When observed a few times within a span of an hour or two, the Big Dipper and Cassiopea rotate around a celestial axis – the extension of Earth’s north-south axis – which actually passes very close to Polaris. This can be recorded by taking a long exposure photograph of that region in the sky, as shown in the photo on the left. 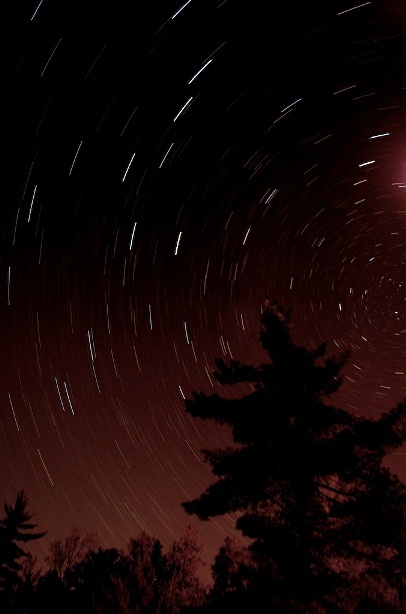 Note how the star trails become longer going from the axis of the rotation outward. Let us explore the meaning of “solstice” and “equinox” in the above image. The summer solstice in the northern hemisphere is the point in the orbit where the Earth’s north pole is directly leaning towards the Sun. This occurs on June 20th or 21st, depending on the leap year. The image on the left illustrates that position during noon in Central European Time (CET). Note that China is completely in daylight. This is the longest day of the year in the northern hemisphere, because the arch that the Sun is going through in the sky is the highest above the horizon. That’s why it is also the warmest season. The Sun is spending more time in the sky and its radiation hits the Earth at an angle that is closer to a right angle. Because the entire arch the Sun is making in the Earth’s sky is shifted to the north, the sunrise on that day is north of the east direction and sunset is north of the west direction. The winter solstice is the opposite point in the orbit, where the north pole is leaning directly away from the Sun. It usually occurs on December 20th or 21st, which is the shortest day of the year. That’s because the Sun is making the lowest arch in the sky, spending less time above the horizon and heating up the Earth at a lower, less effective angle. 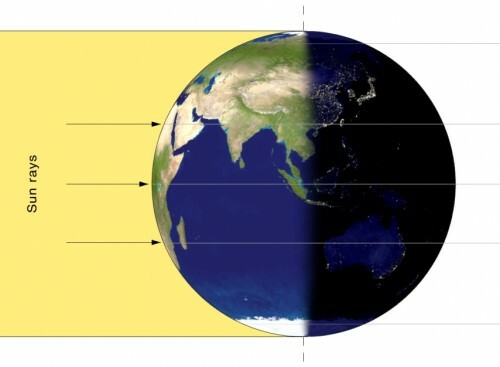 The image on the right shows the winter solstice Earth at the same time of day as the summer solstice image. Note how now almost all of China is already in the dark. This is quite a difference! Because the entire arch the Sun is making in the Earth’s sky is shifted to the south, sunrise occurs south of the east direction and sunset occurs south of the west direction. Of course, everything is reversed for the southern hemisphere. 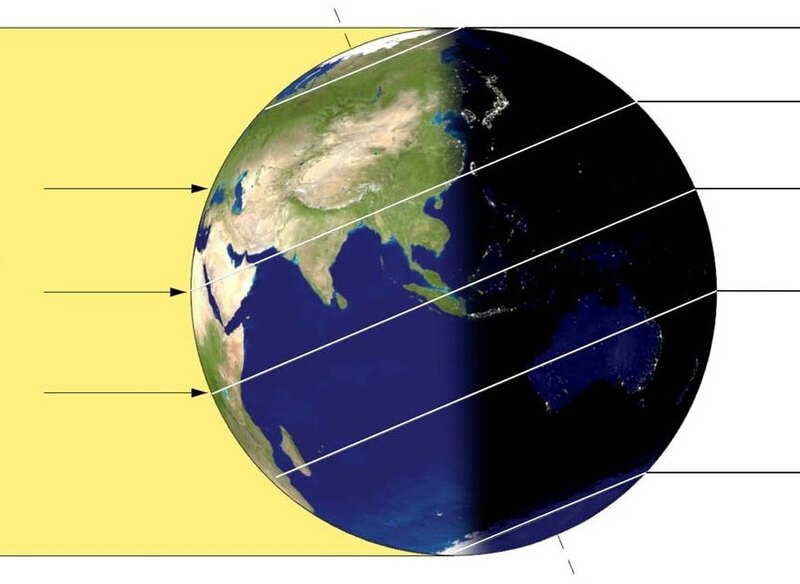 Now, at two points in the orbit of the Earth between the summer and the winter solstices the Earth’s orientation is such that its axis is bowing exactly “side-ways” to the Sun. These are the Vernal (spring) and Autumnal equinoxes, occurring on March 20-21 and September 22-23, respectively (see image on the left). 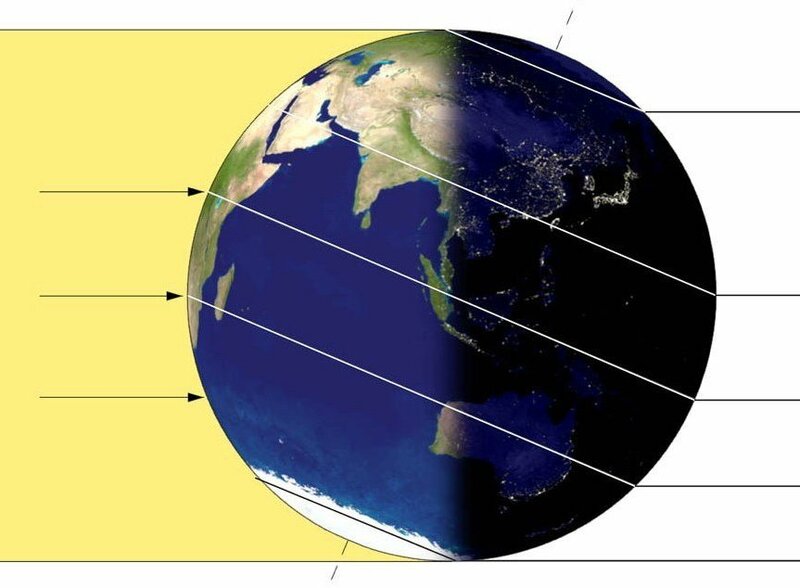 During noon CET, China is half in light, half in dark. During these two days, day and night are equal and the Sun is rising exactly in the east and setting exactly in the west. Many cultures recognized that these four points in the Earth’s orbit could serve as markers for the passage of the year, some kind of reference points. Various monuments around the ancient and even prehistorical world were dedicated to identifying one or few of these four points using openings that allow sunlight in only during a very short time on these days. 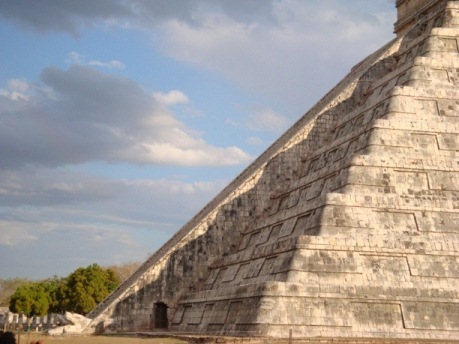 To mention a few, we have the Great Pyramid of Cheops in Giza with each of its four faces showing a division into two halves only on the equinox; the El Castillo pyramid in Chichen Itza, Mexico, that shows a special snake pattern of light on its steps on the spring equinox (see photo on the right); The almost 50 meters high Temple of the Grand Jaguar in Tikal, Guatemala; and almost 6000 years old Cairn T mound in Ireland with its inner chamber lighted by the Sun on the equinoxes. Of course, what was required of these ancient civilizations was just the ability to very accurately align the “equinox-based” monuments along the East-West direction, but is it that easy? Here, for the first time, we go for a moment outside the Earth-Sun system, and point to an object outside the solar system: The line going from the Earth to the Sun and extended to the stars falls on a specific zodiac constellation. Originally, when the zodiac was “conceived” by the Babylonians close to 1000 BC, this constellation was Aries. These ancient astronomers were not aware of the very slow third motion of the Earth, which can be detected only when the first two motions are placed against the backdrop of the stars. It took a little less than 1000 years before some Greek astronomers started noticing a deviation from the Babylonian reference point of the equinox on the zodiac, leading them to conjure the third motion – the precession of the equinoxes. This third motion is akin to a wobbling of a top as it spins (see image on the left), with two significant differences. First,the Earth’s wobble is much slower compared to its spin around itself. 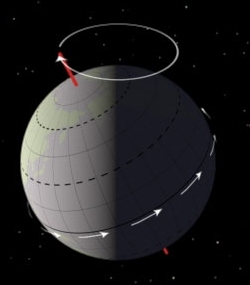 Second, the Earth does not fall off, since the acting force of gravity is not pointing down as it does for a top, but rather “sideways” – the Sun and the Moon cause small periodic variations, due to their changing positions. The important thing to take away from this page is that the spring equinox is like a spoke on a huge wheel that has the solar system at its hub and the constellations of the zodiac at its circumference. The reference point on this celestial wheel was set by the Babylonians to be the spring equinox constellation of their time, namely Aries. However, due to the precession of this celestial wheel, the spring equinox shifts slowly and continually. Since the entire Grand Year takes about 25,800 Earth years and there are 12 zodiac signs, then on average, the equinox points to each one of the zodiac constellations for about 2150 years. These periods are often called Great Months, each constitutes an age dominated by its astronomical-astrological zodiac constellation-sign. The dominant influential sign of the Great Month is the Vernal equinox sign, since the equinox marks the beginning of each Earthly year and represents the seed for the whole year. However, the signs of the Autumnal equinox and of the solstices could provide strong secondary influences as well. One more thing to realize is the direction of the advance of the precession. It is actually going “backwards”! Imagine the Earth as this huge top going around the Sun between two spring equinoxes. Remember the basic definition of the equinox being the point in the orbit at which the axial tilt of the Earth is neither bowing toward the Sun or away from the Sun, but exactly “sideways” to the Sun, creating an equal division of day and night throughout the planet for this one day. Now, after the first equinox, the Earth keeps spinning its daily spin, moving along its annual orbit AND experiences the top-like wobble. This last motion is small but over a whole year it sums up to 20 minutes or so. This means that the Earth will arrive to its next equinox, with exactly the same orientation toward the Sun, 20 minutes earlier! And every year, 20 more minutes are added to this early arrival. At some point, after about 2150 years, these accumulated early arrivals will actually make the equinox alignment of the Earth and the Sun point toward Pisces instead of Aries. This means that the Zodiac Ages are going backwards compared to their annual progression that we are used to, month-by-month. Currently, at the beginning of the 21st century, this equinox alignment is already one step further, and is slowly transitioning from Pisces to Aquarius. Hopefully, this astronomical background will help you understand the emerging phenomenae associated with the Age of Aquarius that are described in the other pages and posts on this site.